The temple, designed by the architect Alfred Parland in memory of the death of Alexander II, is considered one of the main attractions of the city on the Neva. However, the townspeople do not know that the Savior on Blood keeps many mystical mysteries and secrets. We will tell you how the temple turned into a morgue and influenced the collapse of the USSR, where an icon is stored that can predict the future, and why the crosses are kept under water. At one time, the location of the temple played an important role in its history: they say that in order to save the decoration of the temple from the Bolsheviks, the townspeople removed crosses from it and lowered them to the very bottom of the Griboedov channel. Later, when the danger was over, and the Spas on the Blood began to be restored, but could not find the crosses that crowned the temple, a curious case occurred: an occasional passer-by who knew the legend approached the restorers' team and advised them to look for furniture in the water. Workers decided to try and sent a team of divers to examine the bottom - to everyone's surprise crosses were exactly where the stranger indicated. Another curious legend related to the Savior on Blood and the materialization of thought took place already at the very beginning of the 90's. For a long time, one of the main attractions of the city on the Neva for decades stood in the scaffolding, which gave rise to many anecdotes and even found reflection in poems and songs. On the wave among the townspeople there was an ironic belief that, as soon as the forests were removed from the Savior, the entire Soviet Union would collapse. 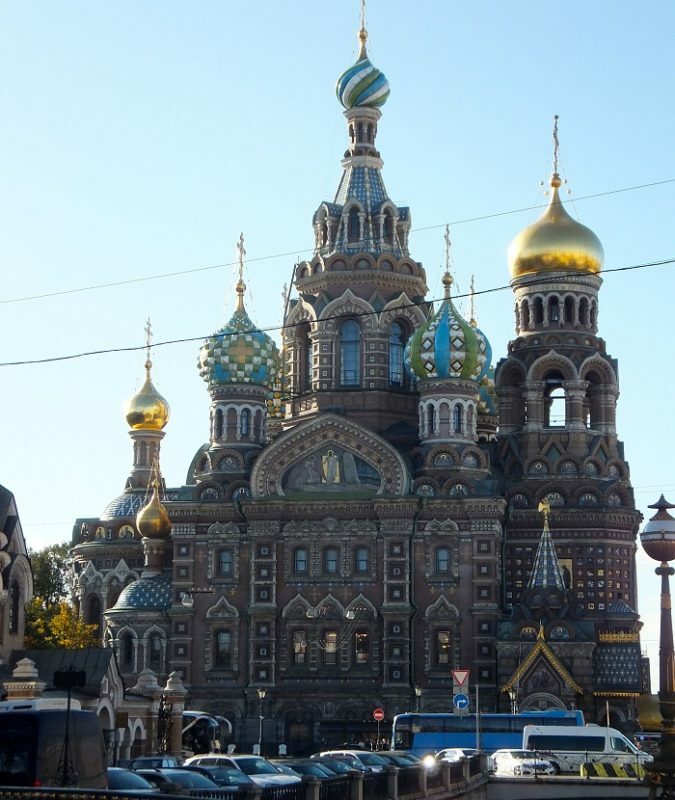 Someone may seem a fable, but someone will write off on the coincidence, but the fact remains: in 1991 the church was "freed" from the scaffolding, and a little later, in August of the same year, the end of Soviet power came to an end. Many people know that one of the main temples of the Northern capital is a real museum of mosaics, because under its roof is collected the richest and largest collection of mosaics, on which the famous domestic masters - Vasnetsov, Nesterov, Belyaev, Kharlamov, Zhuravlev, Ryabushkin and others worked. It is worth noting that the mosaics - the main decor of the temple, because even the iconostasis of the Savior on the Blood is mosaic. It may also seem curious that precisely because of the fact that the works of art have been doing for a very long time, the opening of the temple and its consecration have been delayed for a good ten years. Blockade morgue and "Savior on potatoes"
It's no secret that during the war years (and under the Soviet regime) the churches and temples of the city worked in an unusual mode for them - they were equipping cowsheds or placing enterprises. So, during the siege of the Savior on Blood turned into a real morgue. In the district Dzerzhinsky morgue, which for a time became a church, the bodies of the deceased Leningraders were brought from all over the city, confirming its historical name. In addition, one of the functions of the sights in those hard times was the storage of vegetables - some townspeople with a sense of humor even called it "Savior on potatoes". At the end of the war, the Savior on Blood, again, was not returned to religious function; on the contrary, it was used as a storehouse for the scenery of the Small Opera House, which is now known as Mikhailovsky. The magic of numbers does exist, and the St. Petersburg temple quite successfully proves this - for example, guides who want to add some mystical charm, often turn to numerology and tell that the height of the central building is 81 meters, which is fully consistent with the year of the death of Alexander II , and one more number 63 - not only the height on which one of the domes rises, but also the age of the emperor at the time of the attempt on his life. In addition to the famous ghost of the embankment of the Griboedov Canal, there is another mysterious and mysterious legend (not proven and not refuted): ostensibly under the roof of the Savior on Blood there is an icon on which the fateful years for Russian history have appeared - it appears there in 1917, 1941 and not only. It is believed that the icon has the power and is capable of predicting turning dates for the history of Russia, as other fuzzy silhouettes of numbers can be seen on the canvas - perhaps they will appear as the new tragedy approaches. It is no secret that the Savior on Blood was built on the spot where on March 1, 1881, the last attempt on Emperor Alexander II occurred. Naturally, immediately after the tragic events, the City Council proposed building a small chapel here, but the new emperor Alexander III ordered the chapel not to be limited and to build on this place a magnificent temple. Also, the sovereign ordered to leave inside the future cathedral an untouched section of the pavement where his father's blood was spilled.